The proper diet of a bearded dragon includes fresh fruits and vegetables, along with a meat protein. Most keepers choose to offer crickets as the choice meat protein because they're cheap and easy to buy and breed. But crickets are not always the most ideal meat protein option due to the health issues they can pose. When feeding young bearded dragons, you have to be careful to choose a cricket that is smaller than the width between the beardie's eyes. Even if you think your bearded dragon can eat larger crickets, you should try to stick with that rule of thumb and choose a smaller cricket. If the crickets are too large to pass through the digestive tract, a blockage can build up and cause an impaction, which can become fatal if the problem goes unnoticed and is not treated. Although it's not as common as impaction, bearded dragons can choke on crickets that are too big. You may notice coughing or a gagging sound if your beardie is choking; if possible, you need to try to clear the throat. If you're not there to monitor your bearded dragon while eating, you may not even notice he's choking on his dinner until it's too late. Feeding crickets that are small helps reduce impaction and choking risks. 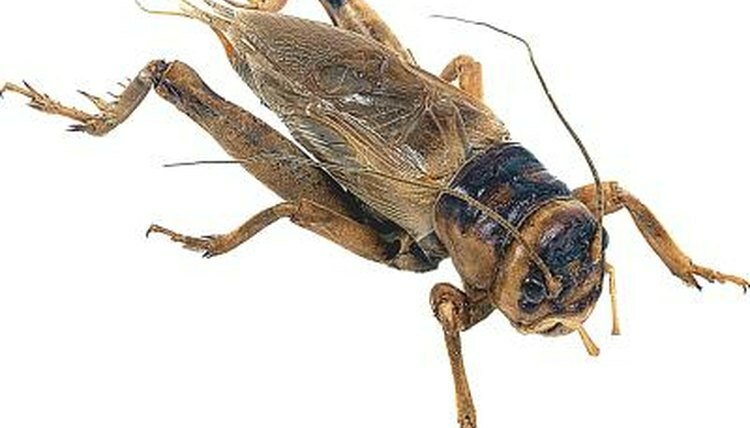 Brown crickets are the ones most pet stores sell; they are nocturnal. Black crickets are also fairly common, though they tend to be more diurnal. Both types of crickets can bite your bearded dragon on the legs, tail or back when left in the closure with your pet. These open wounds need to be kept clean and treated with a topical antibiotic in order to prevent infection. It's not very common for bearded dragons to contract parasites from crickets that are farm raised and sold by reputable cricket breeders and pet stores, but when you catch wild crickets, you may be introducing parasites into your pet's enclosure and his diet. Furthermore, you can't guarantee the wild crickets are uncontaminated. Fertilizers and other poisons can kill your beardie if he consumes a cricket that has been sprayed, or traveled over an area that's been sprayed, by an herbicide or pesticide. What Do Blue Belly Lizards Need to Survive? What Type of Insect Should a Frog Eat? What Kind of Lizard Eats Roaches? How Long Can Bearded Lizards Live?